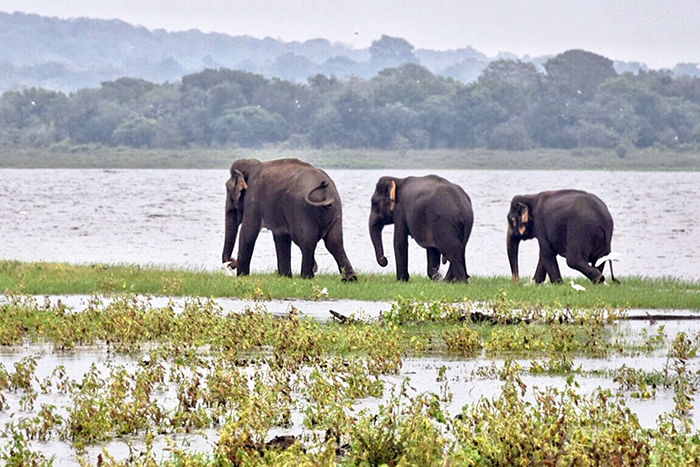 Sure, Sri Lanka has endless beaches, a rich ancient culture, a cuisine that borders on the addictive and some of the loveliest people you’re ever likely to meet, but it also has elephants. Lots of them. 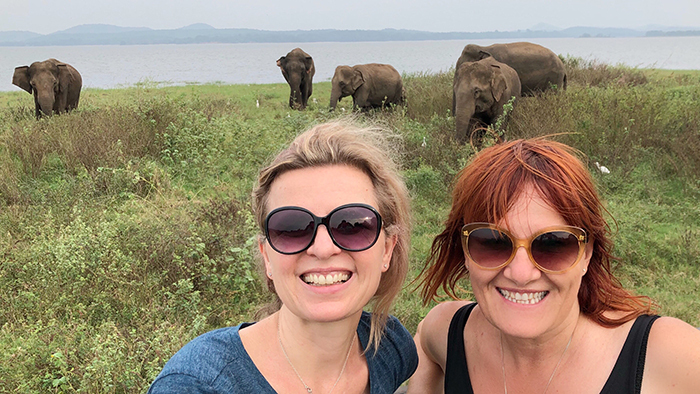 So, when my British-based BFF agrees to meet me in Sri Lanka for a week of gin-infused cultural adventure, a rendezvous with the colossal critters goes straight to the top of our to do list. But as genuine animal lovers, we choose to pass on a popular elephant “orphanage” that’s big with insta douches more interested in a killer selfie than the wellbeing of the elephants. 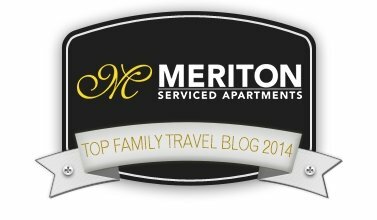 Instead we decide to take our chances with a more ethical jeep safari to spot them in the wild. 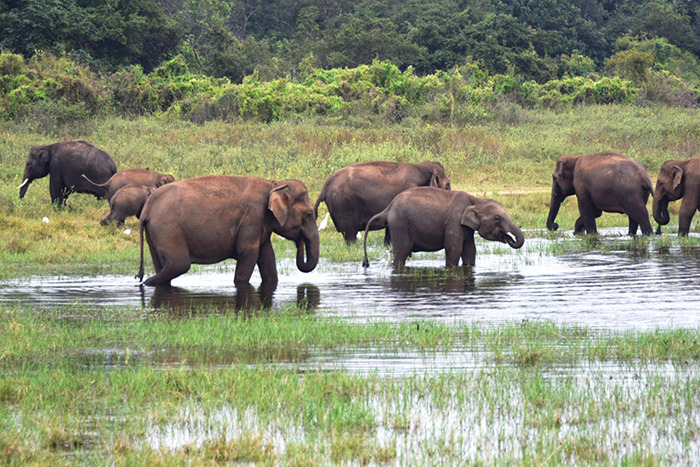 There are three major national parks in the country that are home to elephant herds, but given our route through the North Central Province of Sri Lanka, Minneriya National Park gets our vote. 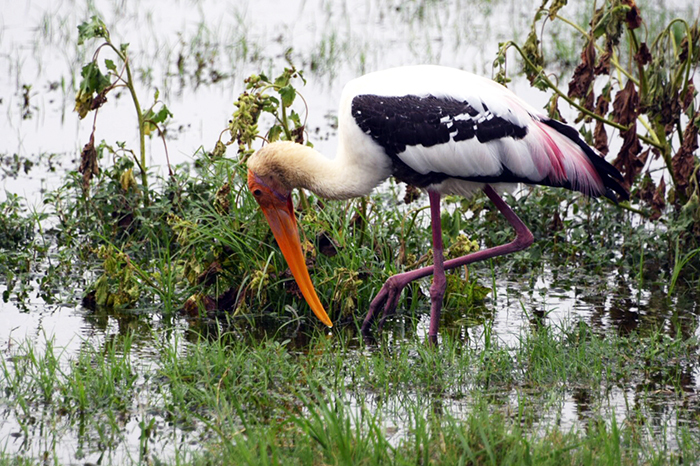 Dominated by the Minneriya Wewa, a reservoir built in the 3rd Century, the 90-square-kilomtere Minneriya National Park boasts diverse natural ecosystems, with forest, bamboo stands, scrub, and wetlands providing shelter for macaques, deer, leopards and several hundred wild Asian elephants. 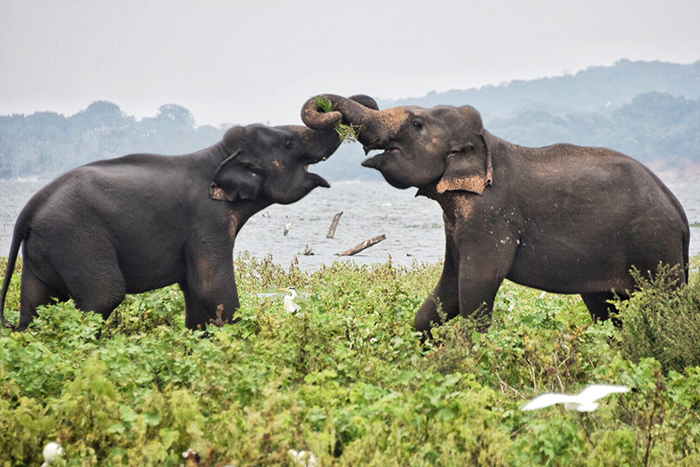 Our private guide for the week, Dilan from Sri Lankan travel experts, Beyond Travel, advises that it is best for us visit the park later in the afternoon as the elephants tend to head to the water hole around that time. It turns out that the lovely Dilan is a very wise man. 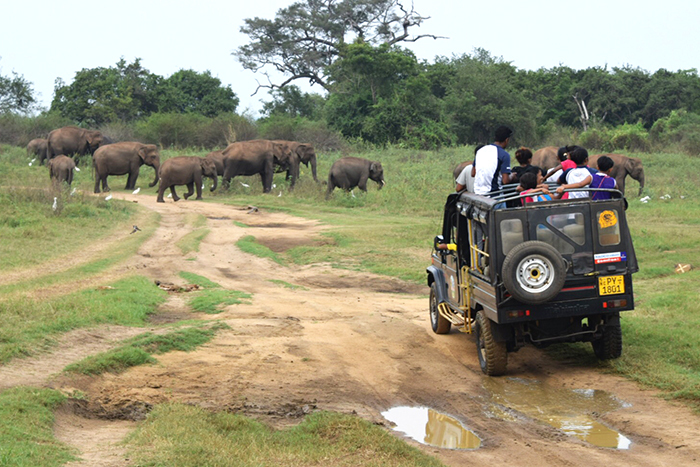 Not only does Minneriya National Park prove to be uncrowded at this time (we see only three other safari vehicles during the entire three hours we explore the park) but we spot our first elephant before we even enter the park. 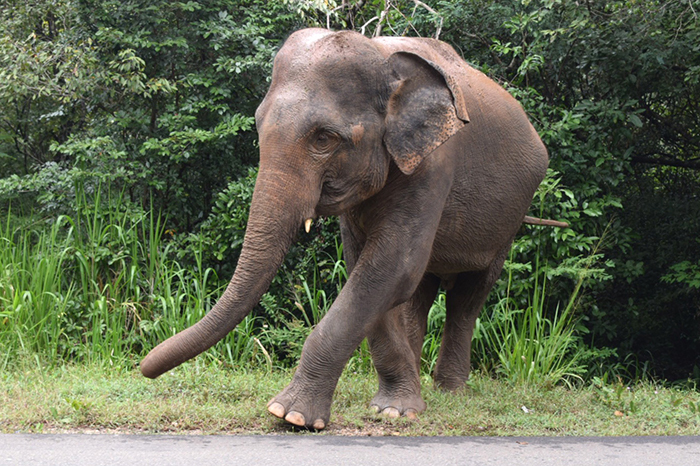 And its a great beast of a bloke ambling drunkenly down the road beside us we near Minneriya, obviously on his way home from the elephant equivalent of a boozy lunch. A safari vehicle and driver is waiting for us and we charge off into the jungle, an eagle-eyed Dilan pointing out macaques, spotted deer, peacocks and flocks of rare birds within minutes of entertaining the gates. 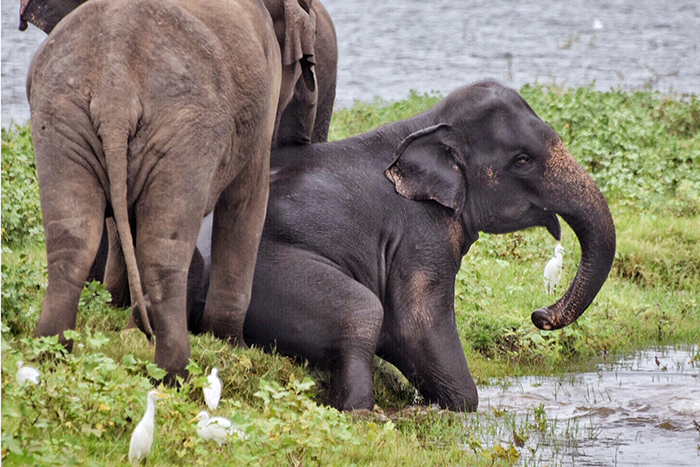 We’re so excited by all the wildlife we almost forget what we’re actually here for until we happen upon the utterly enchanting sight of six adolescent male elephants enjoying their daily bath. 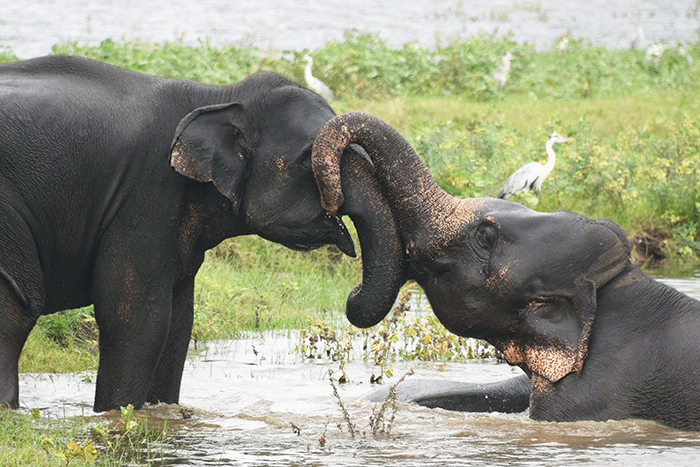 The elephants stop to size us up but, with a happy honk of approval, get straight back to the business of frolicking and rumbling as they play games in the water. 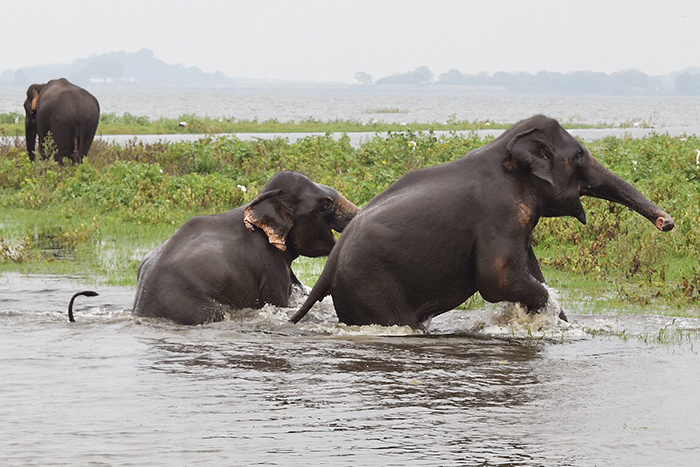 One particularly cheeky elephant pushes his unsuspecting pal into the water, then runs around with a huge triumphant grin. These guys are hilarious. 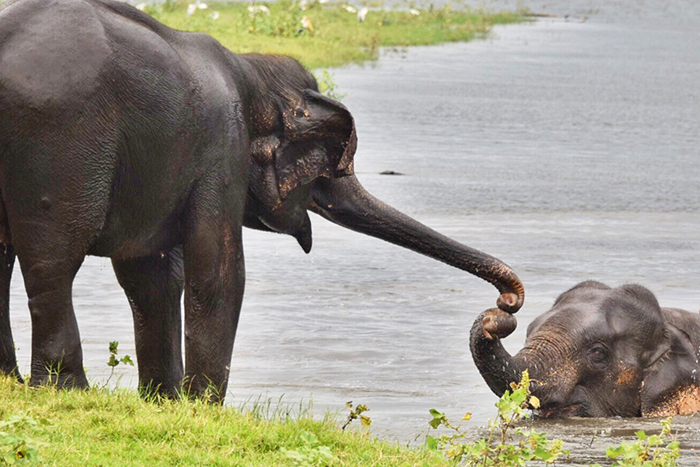 We know that the perky pachyderms, like humans, enjoy rich and complex social lives but it would also appear they have a sense of humour not dissimilar to that of the average human teenage boy. So much so that when one plonks its gargantuan backside on another with shameless glee, I half expect it to stop and tell a fart joke. 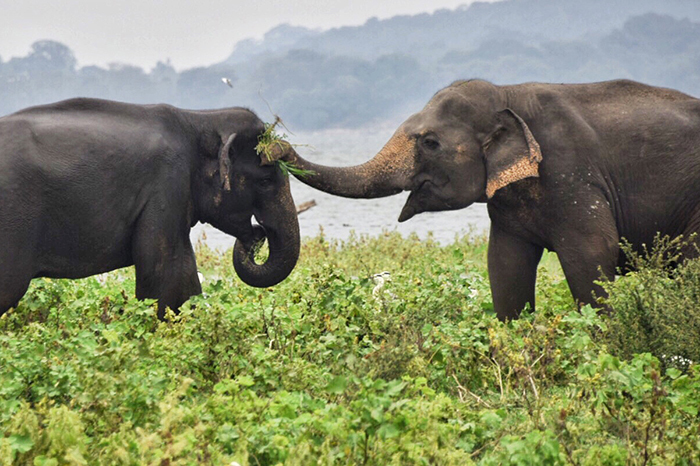 As we watch them joyfully interacting, I think of all the times I’ve heard people excuse themselves for supporting more exploitive elephant attractions by declaring how happy the elephants look, chained though they are into riverbeds or being ridden with a jab in the arse from a metal spike. Not to mention all that awesome fun the perky pachyderms enjoy being socially isolated, dominated and systemically abused like willing participants in a plus-size reenactment of 50 Shades of Grey. 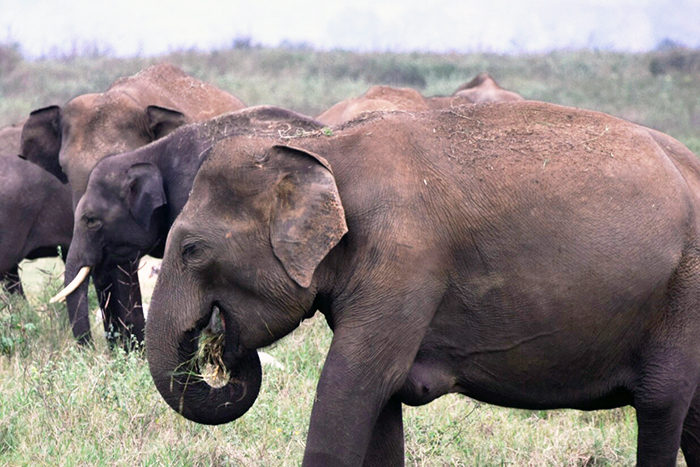 But here in Minneriya National Park we are witnessing what a bunch of truly happy elephants looks like, free from restraints to roam as they please, in the wild, where they belong. The difference in their demeanour is startling. Unlike their captive cousins, none of these highly intelligent, complex creatures has had to endure the ‘crush’. This is a process that involves being imprisoned in a small cage, rendered immobile with ropes, beaten, poked with sharp objects, starved and deprived of sleep until the elephant is ‘broken’ enough for tourists to ride or safely get within a metre of it without being trampled to death. No matter how cleverly you want to market these tourist traps or how contented you think the elephants look, any attraction where you can ride, hug, feed or snap a selfie with a wild animal is not a place where happy elephants reside and you can almost guarantee they’ve been broken. I’ll hop off my soap box now. After spending almost an hour engrossed in the whacky antics of the gorgeous boys, we slowly drive off in search of more of Minneriya National Park’s elephant population and soon spy another small cluster of elephants, these ones a little closer to the road. Judging by the dancing trunk-like appendage that springs out from between the legs of the closest male, he’s quite happy to see us. Seriously, this bad boy has a pecker the size of a baby whale… and it is waving hello with great enthusiasm. 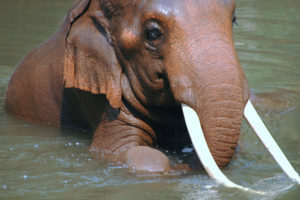 In fact, I think the flirty ‘phant may be winking at me. 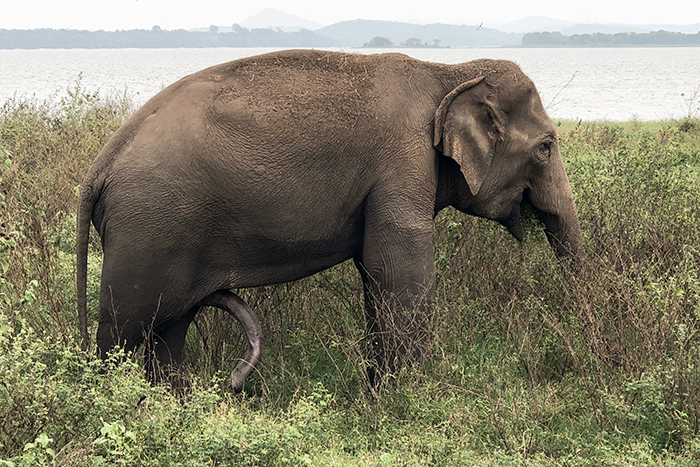 Before he starts humming Marvin Gaye through his other twirling trumpet, we decide to bid a hasty adieu, because I for one don’t want to be on the other end of 3-tonnes of pervy pachyderm. 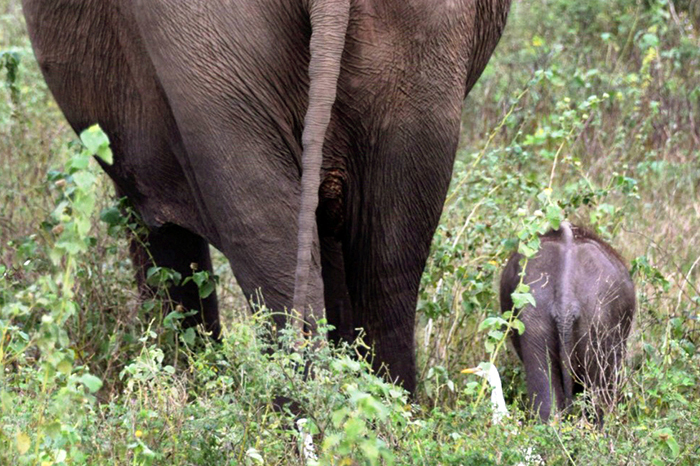 We drive further into the park in search of a few less excitable elephants and come across a largish group of females with a new born baby, still wobbly on its feet. 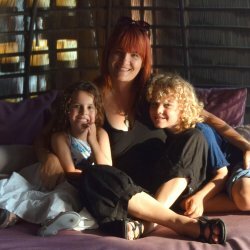 My BFF and I are missing our own babies and, though quietly thanking our lucky stars none of them weighed in at 120 kgs at birth, our hearts explode into maternal mush. While we remain at a discreet distance the ladies of this herd still protectively surround the baby and one trumpets angrily in our direction, clearly telling us to move on. This pair of human mums, in complete sorority with our gargantuan sisters, requests our driver to do just that and leave them to bond with their babe in peace and privacy. 500-metres later we are rewarded with the sight of another larger group of around 30 elephants. These ones are neither on the make or nursing, so once again we stop to quietly observe the complex interrelationships, displays of friendship and familial affection between the animals. It is mesmerising. 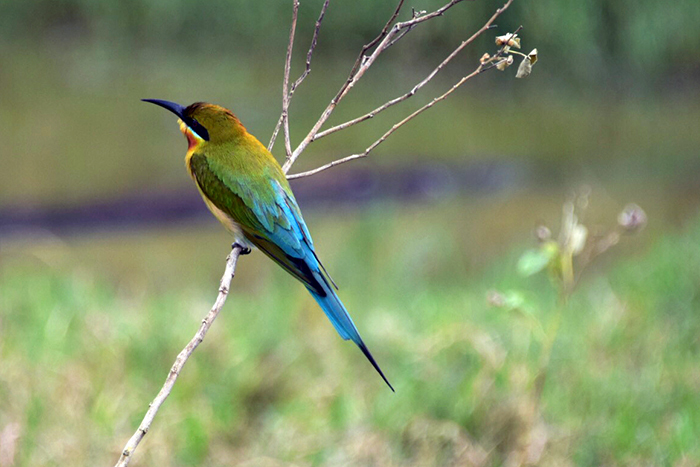 By the time we roll out of Minneriya National Park, we’ve sighted an incredible amount of wildlife and birdlife along with more than 80 wild and happy elephants doing what elephants are meant to do, exactly where they’re meant to be doing it. Every moment has been an emotion-charged, unforgettable privilege and we leave filled with enormous gratitude, not only to those people who have had the foresight to protect these animals, but to our super safari driver and gorgeous guide Dilan for sharing them with us. 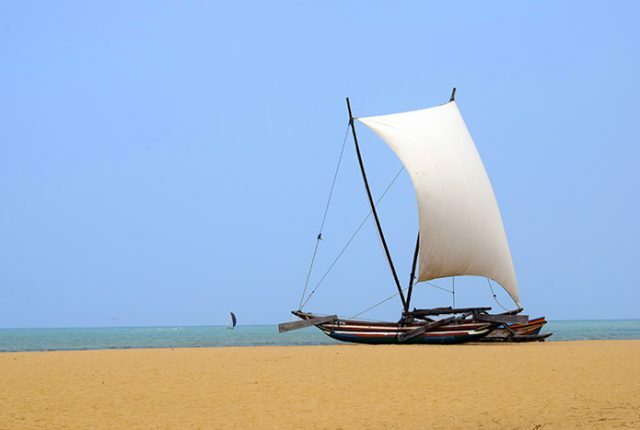 Disclosure: Our Sri Lanka adventure was trip was independently organised and paid for.